? GREAT AROMA medium roast ground coffee blend. You will want to get out of bed just for the smell of this gourmet coffee in the morning. Cupping Notes: Big Body, Low Acidity. with a crisp sweet finish.
? ARTISAN ROASTED fresh to perfection on our small batch roasters, and roasted immediately prior to packaging. Every bag is consistently the same with our roasting profile system!
? SMOOTHEST MEDIUM ROAST cleanest tasting ground coffee ever. Bold flavor but smooth. Not bitter with low acidity. Best choice of gourmet coffees. Great for use in drip coffee machine, automatic coffee makers, cold brew, pour over and french press coffee makers.
? NICE BLEND of Brazil and Colombian coffee beans. This blend includes 100% specialty grade arabica coffee beans that are rich, smooth, medium bodied fairly traded beans. These exotic beans are blended into Koffee Kult medium roasted coffee. There are many types of coffee beans, these are the best gourmet coffee beans you can get.
? EASY TO ORDER Just push the yellow button to order your fresh coffee beans online. Order for your morning coffee or share this awesome coffee with people that deserve the best for birthday gifts, coffee gifts, gifts for her, gifts for him, and christmas gifts. Make waking up to fresh coffee in a coffee cup a reality. For coffee gourmet snobs that need a smooth ground Medium Roast Coffee. You will not be able to walk thru your kitchen without opening this coffee just to smell these freshly medium roasted coffee beans which are 100% arabica coffee. These are the same artisan roasted coffee beans that you will find in gourmet stores, espresso bars and cafes! These fresh roasted coffee beans will get you hooked on gourmet coffee. Koffee Kult Medium Roast coffee is artisan small batch roasted on one of our 15 or 60 kilo coffee roasting machines overseen by a roast master with 25 plus years of experience. 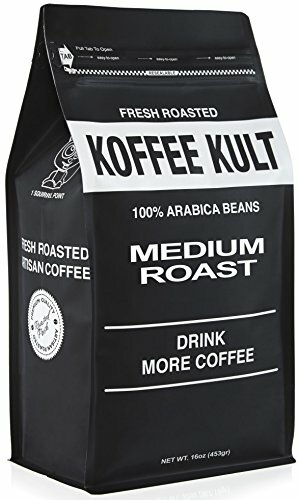 Koffee Kult Medium Roast coffees has a roasting profile brought before second crack in the roasting process and then released into the cooling bin for a fuller, more even flavor. This coffee is roasted in the USA to USA food standards, not a third world country. Then packaged as whole bean and ground coffee to ensure optimal freshness in a resealable coffee bag with a one way value to enable the beans to degas while keeping air out. The selected speciality grade 100% arabica coffee meets SCAA specialty grade coffee standards. These coffee beans are ethically sourced in the blend are from Columbia and Brazil which produces the best gourmet coffee beans in the world. Your search for gourmet coffee beans is over. Brew some of your new medium whole bean coffee and see how it tastes. Order some today, your order will be delivered to your doorstep for your delicious morning experience of the best coffee. These awesome coffee beans best sellers are on coffee snobs favorites list.